Tags: Boalt, How to: Zen, What LSAT score do I need? A lot of people ask about which law schools they can get accepted to with "x GPA and y LSAT." This often happens even before the test in a speculative mode, such as, "I have a 3.45, what kind of LSAT score do I need to get into Boalt?" These numbers mean that an "average" applicant with that score combination was accepted (and enrolled). Obviously, being below the median lowers your chance of admission, while scoring above increases it. I couldn't bring myself to have "below the median" in red, as those scores are still impressive, highlighting how difficult it can be to be accepted to a top law school. In the example of Boalt above, it's possible to cross reference the two scores into a target LSAT score for a student with a 3.7 GPA, such as "Diane." 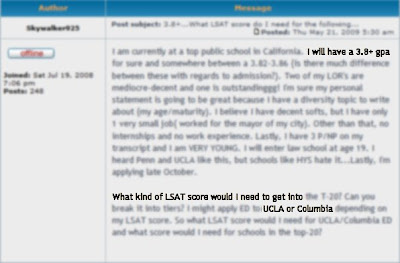 Being at the lower GPA bound of the average admitted pool, it would be best for Diane to score at least a 170 on the LSAT to solidly fit within Boalt's acceptance range. Conversely, a student with a stronger GPA of 3.92, "James," at the higher bound of the average admitted pool could score a 164 or above and still have a strong chance for being accepted. Basically, criss-cross reference where your GPA falls within the median to find your target LSAT score. Here is a graph comparing the predicted acceptance rate for each fictional student, Diane and James, with their LSAT score as the independent variable. The data are taken from the law school calculator, which has a link on the toolbar to the right under "Zen + These = 99th Percentile." It's pretty self-explanatory, but we'll have our two current students walk you through their own law school calculations as part of a goal setting exercise in video posts later this week. As with any admissions advice, it is rarely that clear cut during the actual application process. For instance, due to differences in Diane's or James's underrepresented minority status, in-state residency (as Boalt is part of the University of California system), and "soft factors" (a catch all term for any part of your application that is not a GPA or LSAT score), it's quite possible that Diane could be admitted with a 160 LSAT while James could be rejected even if he scored a 170. 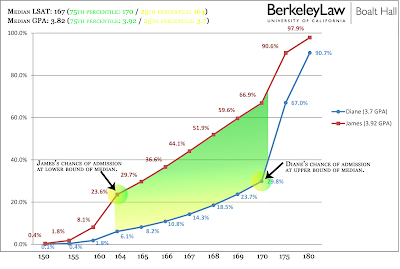 Additionally, as you can see from the graph comparing their respective chances for acceptance, GPA plays an unusually large role in admissions decisions at Boalt, and high GPA/low LSAT splitters still have a fighting chance. However, all other factors being equal, these numbers form a basic answer for the questions above: "I have a 3.81 GPA--the middle of Boalt's GPA--so I should score at least a 167--the middle of Boalt's LSAT. The question then becomes: "What if I don't have a GPA that's within the median range?" If your GPA is above the 75th percentile, then you're sitting pretty and should shoot for at least the 25th percentile LSAT score. If your GPA is below, especially significantly below, then you'll need to resort to more carefully calibrated tools, which we'll discuss in a later post. And the answer to the question at the beginning of the post: 180. Get your Zen on.